Throughout the race, critics have contended that the media were besotted with Barack Obama’s candidacy; Hillary Clinton made the accusation first, most memorably in a debate during the primaries in late February. McCain’s campaign has leveled the criticism as well throughout the general election phase, particularly since the conventions. The evidence suggests something more complicated than that. Coverage of Obama since the conventions has been more positive than negative, but it has also been almost as neutral or mixed. In all, 36% of stories about Obama have been positive, vs. 35% that have been neutral. And 29% have been negative. One metric is how they compare with past studies, both those earlier in this race and from other years. Obama’s are similar to those recorded by the Project four years ago during a two-week period dominated by debates between John Kerry and George Bush. That year, 34% of Kerry stories were positive, while 25% were negative and 41% neutral. In 2000, when George Bush enjoyed more positive coverage than Al Gore, the depiction of him in the press was less flattering (24% positive, 27% neutral and 49% negative). This year’s study covers a much broader period of time, nearly six weeks. 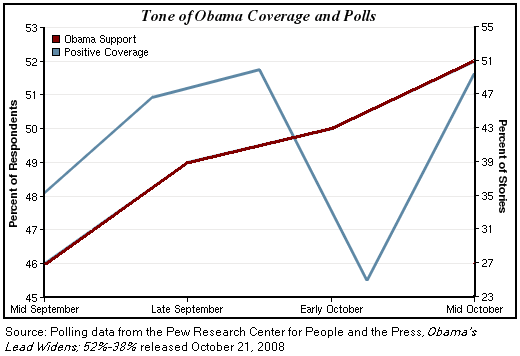 Obama’s positive coverage, in other words, falls below what we have seen for him earlier in the race, but is more positive than George Bush received in his two victories in 2000 and 2004. Another element to consider is the shifts in the tone of coverage over time. The media depiction of Obama also changed over the six weeks between the conventions and the last presidential debate—as the polls changed. The portrayal of Obama in this period began fairly negative. During the week after the Republican convention (Sept. 8-14), for instance, coverage of Obama was about twice as negative as positive (41% negative vs. 20% positive and 39% neutral). The following week, when the economic crisis began (Sept. 15-23), the tone shifted, becoming more mixed (35% positive, 35% neutral, 30% negative). And in the next period (Sept. 24-28), when Obama prepared to debate while McCain suspended his campaign and both candidates returned to Washington for a White House meeting, Obama enjoyed his most decidedly positive coverage of the race. 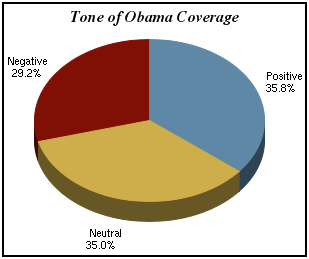 Nearly half of all stories about Obama were clearly positive in tone (47%), while less than one-in-ten were clearly negative (8%). Some of that positive coverage was related to evidence that the financial crisis was aiding Obama. “Recent economic woes have given Democrat Barack Obama a clear lead over Republican John McCain,” declared a story posted on AOL News on Sept. 24, citing a 9-point lead for Obama in a new Washington Post/ABC News poll. That more positive tone for Obama continued through the vice presidential debate a week later when 50% of stories about him were positive, while 38% were neutral and 13% were negative. 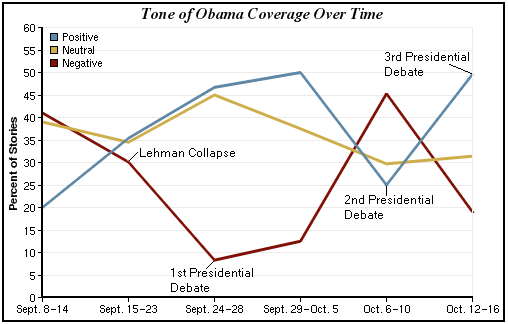 However, the week of the second presidential debate (Oct. 6-10), the tone changed again, becoming more negative. The week of that encounter, a point when the overall tenor of the campaign grew noticeably harsher and the McCain camp linked Obama with ‘60’s radical William Ayers, 45% of the stories studied about Obama were negative, while 25% were positive and another 30% were mixed. The McCain attacks worked, in other words, in changing the dialogue in the media, as well as the tone of that dialogue. The last week of the study (Oct. 12-16), which included the final presidential debate, coverage of Obama became more positive again (50% positive, vs. 19% negative and 31% neutral). How much of the coverage of Obama is simply a reflection of his leading in the polls? The data clearly point in this direction for some of the explanation. Of those stories that focused mostly on polls, a clear majority (57%) were positive for Obama, while less than a quarter (23%) were negative. Similarly, stories about the electoral map, swing states and campaign strategy were even more favorable (77% positive vs. 6% negative). These represent the most positive element of Obama’s coverage. The data also suggest there is some truth to the idea that the financial crisis was a boon to Obama in the media narrative, though less than was the case with these horse race-oriented stories. Coverage of the economy and financial meltdown was more likely to be positive as negative (36% vs.23%). The more political component of the financial crisis hitting the campaign helped Obama even more: Obama stories concerning McCain’s announcement that he would suspend campaigning to respond to the crisis were positive 44% vs. 9% negative. Meanwhile, the attacks back and forth between the candidates tended to hurt Obama in the press, though they also involved substantial risk for McCain. 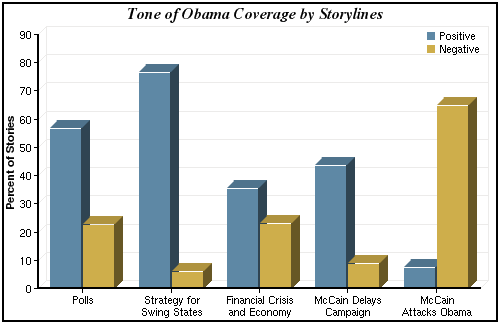 Stories about those harsher attacks were 65% negative and only 7% positive for Obama. The rare instances where Obama was seen to have misspoken on the stump also hurt. In the fairly limited coverage of Obama’s remark about putting lipstick on a pig, for instance, 50% of the stories turned out to be negative. Only a single account of the incident was positively portrayed. In short, the financial crisis and particularly Obama’s steadier reaction to it in relation to McCain’s were clearly a turning point in the media coverage. That more positive coverage was then reflected in the polls, which in turn were reinforced in the horse race coverage that played off those polls. In that sense, the data show, Obama was the beneficiary of the tactical, strategic bias of the press. 1. The 2000 and 2004 studies covered two-week time periods during the debate and studied slightly different universes of outlets. For the full methodologies and findings of these reports, see Last Lap: How the Press Covered the Final Stages of the 2000 Campaign and The Debate Effect: How the Press Covered the Pivotal Period of the 2004 Campaign. For full details on how the coding of tone in this report compared with the coding for tone in PEJ’s previous reports, see the Tone Variable section in the methodology. 2. “Character and the Primaries of 2008,” May 29, 2008. This analysis identified, for each of the five main candidates at the time, the most prominent narrative themes in the coverage leading up to the Iowa primary. We found between four and seven narratives, depending on the candidate. We then measured how often that narrative was asserted or refuted in news stories during the primary season itself.